However, many restrictions will remain in place. 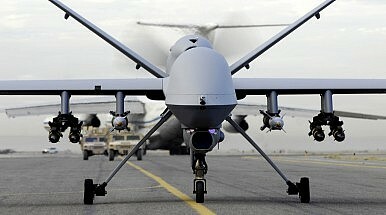 States interesting in purchasing U.S. armed drones have to agree to a set of “proper use” principles and, according to an unclassified summary of the policy, not use UAVs “to conduct unlawful surveillance or [for] unlawful force against their domestic populations.” So far, the United States has only exported lethal drones to the United Kingdom. Other allies, such as France and Italy, have purchased unarmed U.S. drones in the last few years, but have not been provided with weapons. “The technology is here to stay. It’s to our benefit to have certain allies and partners equipped appropriately,” summarized a senior State Department official the rationale behind the decision. In the past, the State Department in particular has been worried that an easing of export restrictions would weaken broader non-proliferation regimes. The Washington Post also reports that companies interested in exporting armed UAVs, such as the Reaper and Predator combat drones, will still be subject to “an unconditional strong presumption of denial,” i.e. the assumption that countries will not export Category I drones (systems which exceed a range of 300 kilometers and a payload of 500 kilograms), as outlined in the Missile Technology Control Regime (MTCR), except in highly unusual circumstances. A June 2014 report by the Stimson Center’s Drone Task Force, noted on this subject that, “The U.S. government should also inquire into the broader non-proliferation effect of the MTCR Category I presumption of denial. The U.S. government should determine whether, in the long run, the presumption remains a useful non-proliferation tool or inadvertently fosters the growth of foreign UAV manufacturing capability by suppressing the participation of U.S. industry in the global MTCR Category I UAV market.” However, no further details on the exact policy governing the sales of Category I drones have been made publicly available as of now.